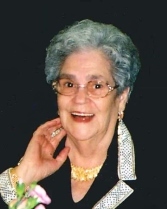 Maria L. Santos, of Lawrence, passed away on Tuesday, October 30, 2018 at Prescott House in North Andover. The wife of the late Alfredo N. Santos, she was 86 years of age. Born and raised in Portugal, Maria was one of four siblings born to the late Manuel DeCosta Amaral and Maria DeDeus Guerrouxo. A family oriented person, Maria was a strong and very sharp-minded woman who deeply cared for her family. In addition, she was a hard worker all throughout her life. She was very sweet and was a peacemaker for all of her children. Maria was an avid crotchetier and was a wonderful cook. She enjoyed traveling everywhere, loved to go shopping, and liked to talk on the phone with family and friends. Sadly, in addition to her parents, Maria was pre-deceased by her son, Carlos Santos; grandchildren, Peter Rebelo, and Michelle Aguiar; sister, Clotilde Vallacorba and her husband, Antonio. Maria is lovingly survived by her children, Elmira Aguiar and her husband, Adao of Methuen, Gilda Cafua and her husband, Fernando of North Andover, Alfredo Nicolau and his wife, Rosa of Middleton, Natercia Rebelo of Manchester, NH, Claudio Santos and his wife, Nellie of Boxford, Manuel Santos of Lawrence, and Coralia Couto and her husband, Floriano of Bow, NH; siblings, Regina Fontes and her husband, Manuel of Montreal, and Liliana Pimentel and her husband, Gilbert of Montreal; also survived by 17 grandchildren and 24 great-grandchildren. Relatives and friends are respectfully invited to attend visiting hours on Thursday, November 1, 2018 from 5:00 - 9:00 PM at Cataudella Funeral Home, 126 Pleasant Valley Street in Methuen. A funeral mass will be held at 10:00 AM at Corpus Christi Parish at Holy Rosary Parish in Lawrence. Entombment will be held in Eternal Light Mausoleum in Salem, NH.